Most vehicle manufacturers approve blends up to B5, and some approve blends up to B20. Check with your owner’s manual or vehicle manufacturer to determine the right blend for your vehicle, since using the wrong blend could damage your engine and/or void the manufacturer’s warranty. Note: You should never fuel your vehicle with clean or used grease or vegetable oil that has not been converted to biodiesel. It will damage your engine. 2% biodiesel, 98% petrodiesel is labeled B2. Biodiesel can be used in pure form (B100) or may be blended with petroleum diesel at any concentration in most injection pump diesel engines. New extreme high-pressure (29,000 psi) common rail engines have strict factory limits of B5 or B20, depending on manufacturer. 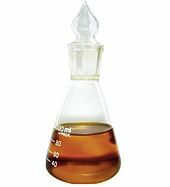 Biodiesel has different solvent properties than petrodiesel, and will degrade natural rubber gaskets and hoses in vehicles (mostly vehicles manufactured before 1992), although these tend to wear out naturally and most likely will have already been replaced with FKM, which is nonreactive to biodiesel. Biodiesel has been known to break down deposits of residue in the fuel lines where petrodiesel has been used. As a result, fuel filters may become clogged with particulates if a quick transition to pure biodiesel is made. Therefore, it is recommended to change the fuel filters on engines and heaters shortly after first switching to a biodiesel blend. In 2005, Chrysler (then part of DaimlerChrysler) released the Jeep Liberty CRD diesels from the factory into the American market with 5% biodiesel blends, indicating at least partial acceptance of biodiesel as an acceptable diesel fuel additive. In 2007, DaimlerChrysler indicated its intention to increase warranty coverage to 20% biodiesel blends if biofuel quality in the United States can be standardized. Mercedes Benz does not allow diesel fuels containing greater than 5% biodiesel (B5) due to concerns about “production shortcomings”. Any damages caused by the use of such non-approved fuels will not be covered by the Mercedes-Benz Limited Warranty. In 2007, McDonalds of UK announced it would start producing biodiesel from the waste oil byproduct of its restaurants. This fuel would be used to run its fleet. In 2001, UC Riverside installed a 6-megawatt backup power system that is entirely fueled by biodiesel. Backup diesel-fueled generators allow companies to avoid damaging blackouts of critical operations at the expense of high pollution and emission rates. However, by using B100, these generators were able to essentially eliminate the byproducts that result in smog, ozone, and sulfur emissions; the use of these generators in residential areas around schools, hospitals, and the general public result in substantial reductions in poisonous carbon monoxide and particulate matter. Biodiesel is commonly produced by the transesterification of the vegetable oil or animal fat feedstock. There are several methods for carrying out this transesterification reaction including the common batch process, supercritical processes, ultrasonic methods, and even microwave methods. A by-product of the transesterification process is the production of glycerol. For every 1 tonne of biodiesel that is manufactured, 100 kg of glycerol are produced. Originally, there was a valuable market for the glycerol, which assisted the economics of the process as a whole. However, with the increase in global biodiesel production, the market price for this crude glycerol (containing 20% water and catalyst residues) has crashed. Research is being conducted globally to use this glycerol as a chemical building block. One initiative in the UK is The Glycerol Challenge. Usually this crude glycerol has to be purified, typically by performing vacuum distillation. This is rather energy intensive. The refined glycerol (98%+ purity) can then be utilized directly, or converted into other products. The following announcements were made in 2007: A joint venture of Ashland Inc. and Cargill announced plans to make propylene glycol in Europe from glycerol and Dow Chemical announced similar plans for North America. Dow also plans to build a plant in China to make epichlorhydrin from glycerol. Epichlorhydrin is a raw material for epoxy resins. In 2007, biodiesel production capacity was growing rapidly, with an average annual growth rate from 2002-06 of over 40%. For the year 2006, the latest for which actual production figures could be obtained; total world biodiesel production was about 5-6 million tonnes, with 4.9 million tonnes processed in Europe (of which 2.7 million tonnes was from Germany) and most of the rest from the USA. In 2008 production in Europe alone had risen to 7.8 million tonnes. In July 2009, a duty was added to American imported biodiesel in the European Union in order to balance the competition from European, especially German producers. The capacity for 2008 in Europe totaled 16 million tonnes. This compares with a total demand for diesel in the US and Europe of approximately 490 million tonnes (147 billion gallons). Total world production of vegetable oil for all purposes in 2005/06 was about 110 million tonnes, with about 34 million tonnes each of palm oil and soybean oil. Sewage Sludge – The sewage-to-biofuel field is attracting interest from major companies like Waste Management and startups like InfoSpi, which are betting that renewable sewage biodiesel, can become competitive with petroleum diesel on price. Many advocates suggest that waste vegetable oil is the best source of oil to produce biodiesel, but since the available supply is drastically less than the amount of petroleum-based fuel that is burned for transportation and home heating in the world; this local solution could not scale to the current rate of consumption. Animal fats are a by-product of meat production and cooking. Although it would not be efficient to raise animals (or catch fish) simply for their fat, use of the by-product adds value to the livestock industry (hogs, cattle, poultry). Today, multi-feedstock biodiesel facilities are producing high quality animal-fat based biodiesel. Currently, a 5-million dollar plant is being built in the USA, with the intent of producing 11.4 million liters (3 million gallons) biodiesel from some of the estimated 1 billion kg (2.2 billion pounds) of chicken fat produced annually at the local Tyson poultry plant. Similarly, some small-scale biodiesel factories use waste fish oil as feedstock. An EU-funded project (ENERFISH) suggests that at a Vietnamese plant to produce biodiesel from catfish (basa, also known as pangasius), an output of 13 tons/day of biodiesel can be produced from 81 tons of fish waste (in turn resulting from 130 tons of fish). This project utilizes the biodiesel to fuel a CHP unit in the fish processing plant, mainly to power the fish freezing plant. 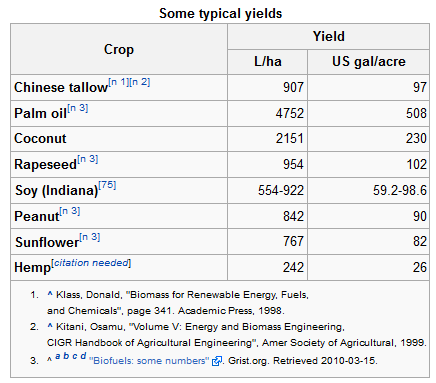 If the entire arable land area of the USA (470 million acres, or 1.9 million square kilometers) were devoted to biodiesel production from soy, this would just about provide the 160 million tonnes required (assuming an optimistic 98 US gal/acre of biodiesel). This land area could in principle be reduced significantly using algae, if the obstacles can be overcome. The US DOE estimates that if algae fuel replaced all the petroleum fuel in the United States, it would require 15,000 square miles (38,849 square kilometers), which is a few thousand square miles larger than Maryland, or 30% greater than the area of Belgium, assuming a yield of 140 tonnes/hectare (15,000 US gal/acre). Given a more realistic yield of 36 tonnes/hectare (3834 US gal/acre) the area required is about 152,000 square kilometers, or roughly equal to that of the state of Georgia or of England and Wales. The advantages of algae are that it can be grown on non-arable land such as deserts or in marine environments, and the potential oil yields are much higher than from plants. One of the main drivers for adoption of biodiesel is energy security. This means that a nation’s dependence on oil is reduced, and substituted with use of locally available sources, such as coal, gas, or renewable sources. Thus a country can benefit from adoption of biofuels, without a reduction in greenhouse gas emissions. While the total energy balance is debated, it is clear that the dependence on oil is reduced. One example is the energy used to manufacture fertilizers, which could come from a variety of sources other than petroleum. The US National Renewable Energy Laboratory (NREL) states that energy security is the number one driving force behind the US biofuels program, and a White House “Energy Security for the 21st Century” paper makes it clear that energy security is a major reason for promoting biodiesel. The EU commission president, Jose Manuel Barroso, speaking at a recent EU biofuels conference, stressed that properly managed biofuels have the potential to reinforce the EU’s security of supply through diversification of energy sources. The Volumetric Exercise Tax Credit (VEETC) was the main source of financial support for biofuels, but was scheduled to expire in 2010. Through this act, biodiesel production guaranteed a tax credit of US$1 per gallon produced from virgin oils, and $0.50 per gallon made from recycled oils. The European Union is the greatest producer of biodiesel, with France and Germany being the top producers. To increase the use of biodiesel, there exist policies requiring the blending of biodiesel into fuels, including penalties if those rates are not reached. In France, the goal was to reach 10% integration but plans for that stopped in 2010. As an incentive for the European Union countries to continue the production of the biofuel, there are tax rebates for specific quotas of biofuel produced. In Germany, the minimum percentage of biodiesel in transport diesel is set at 4.4%, and will remain at that level until 2014. According to the EPA’s Renewable Fuel Standards Program Regulatory Impact Analysis, released in February 2010, biodiesel from soy oil results, on average, in a 57% reduction in greenhouse gases compared to petroleum diesel, and biodiesel produced from waste grease results in an 86% reduction. However, environmental organizations, for example, Rainforest Rescue and Greenpeace, criticize the cultivation of plants used for biodiesel production, e.g., oil palms, soybeans and sugar cane. They say the deforestation of rainforests exacerbates climate change and that sensitive ecosystems are destroyed to clear land for oil palm, soybean and sugar cane plantations. Moreover, that biofuels contribute to world hunger, seeing as arable land is no longer used for growing foods. The Environmental Protection Agency (EPA) published data in January 2012, showing that biofuels made from palm oil won’t count towards the nation’s renewable fuels mandate as they are not climate-friendly. Environmentalists welcome the conclusion because the growth of oil palm plantations has driven tropical deforestation, for example, in Indonesia and Malaysia.